Under the middle of Mělník’s main square is a well that measures 4 metres across, reaches at least 54 metres below the surface and once supplied the town with all its drinking water. Several times each day a guided tour leaves from the tourist information office to visit it. 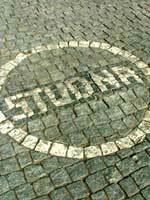 As the guide walks you across the square to the town hall, where the entrance to the underground tunnels is tucked away in a small outbuilding, he points out a circle of white cobblestones enclosing the word “studna” which marks the location of the huge underground well. The well dates from around the end of the thirteenth century, and was Mělník’s main source of drinking water. As the town grew, a single source of water wasn’t enough and by the middle of the 16th century a different system using several fountains and a water tower had taken its place. 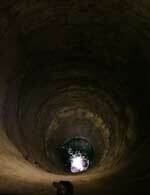 During the 18th century the well was valued for its medieval aesthetics and a chapel was built over its head. When the romantic movement faded in the late 19th century, the chapel was demolished and the well was finally covered with a brick arch and paved over. It is still however accessible from underground. After an introduction and the opportunity to don a hardhat (the guide recommends it for tall people) it’s down into the tunnels and the first of the underground caverns right beneath the town hall. There’s a modern brick pillar here that was built during the early 20th century construction of the town hall. The architects were afraid the surface wouldn’t hold the weight of the new building so it was reinforced from beneath in three places. 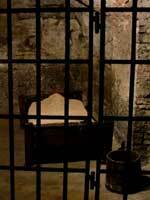 Further along is a mock up of a torture chamber, even though the catacombs here were never used as a prison or dungeons. They were the storage spaces of individual houses, and commercial enterprises like breweries and wineries. 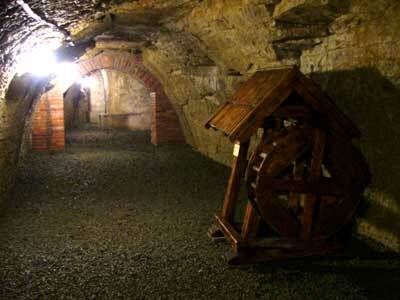 By linking the individual cellars the resulting tunnels became a refuge against fire or attack in times of war. The tunnels are typically about three metres wide, which was narrow enough to guard against cave-ins of the relatively soft sandstone. The height of the tunnels is anything from two to five metres, and they go as far as 10 metres below the surface of the square. The whole tour takes about 30 minutes, even though it’s only about three hundred metres in total. The guide goes into very detailed information; far more than is included in the English printed translation. Photography is permitted in the tunnels, so it’s possible to fill some of the extra time like that, but a healthy dose of patience is still a good thing to bring along for this tour.